In a new blog post for Virgin.com, billionaire Richard Branson writes about his recent flirtation with death, when he got into a gruesome bike accident while training for the Virgin Strive Challenge in the Caribbean. Here’s how it happened: Branson was biking down a hill as it got dark. He hit a speed bump head on, and next thing he knew, he body was flung over his handlebars. “My life was literally flashing before my eyes,” Branson writes. 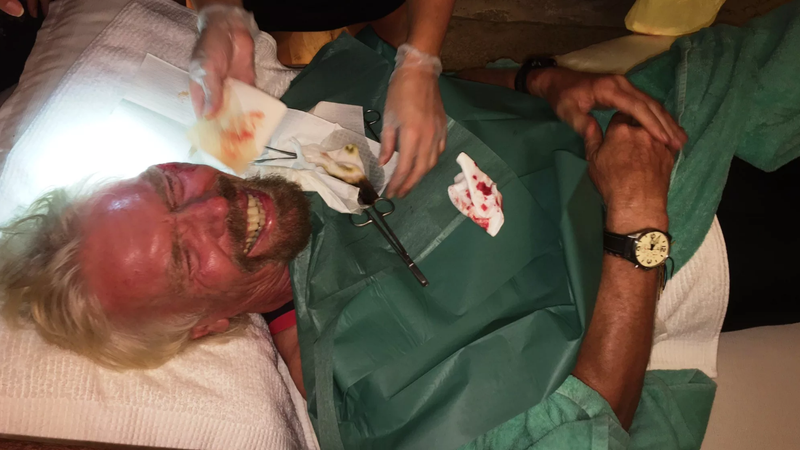 As Branson notes, he’s got a bit of an unlucky streak with physical injuries and brushes with death. This year alone, he writes, he’s knocked his teeth out playing tennis “not once but twice,” and also been “kissed by a ray and [run] into a bullet proof door.” Stay safe, Richie. How Many Taxpayer-Funded Spaceports Does Richard Branson Need?